I believe school librarians must have a pulse on the larger educational landscape. I find reading educational journals benefits my own work. Educational Leadership’s March 2016 issue titled “Learning for Life” is one of my favorites that truly resonated with me. In his article “Lifeworthy Learning,” Harvard professor David N. Perkins poses the question: “What learning really matters for today’s learners?” He goes on to suggest six “Beyonds”; that is ways that he believes the “education universe is expanding.” His Beyonds all dovetail with the National School Library Standards, and several stood out as clearly the purview of learner-ready school librarians. Here are three that jumped off the page for me. The first Beyond is: “Beyond content to 21st century skills and competences. A contemporary education is not just about the facts or even conceptual understanding of content; it’s also about critical and creative thinking, collaboration, communication, citizenship skills, and more” (Perkins 2016). Ponder your work in helping learners extend their learning beyond content knowledge. How do you help them engage in deep thinking, inquiry, and problem solving? By implementing the AASL Standards with fidelity in your school community! 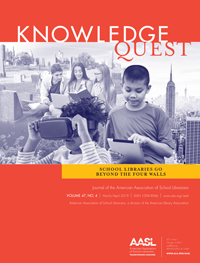 Look at the key commitment for Inquire: “Build new knowledge by inquiring, thinking critically, identifying problems, and developing strategies for solving problems” (AASL 2018). Inquire aligns perfectly with the first of the Beyonds. Now reflect on Collaborate and its key commitment: “Work effectively with others to broaden perspectives and work toward common goals” (AASL 2018). When our learners can demonstrate their abilities to actively contribute to group discussions and recognize learning as a social responsibility, they are indeed exhibiting collaboration, communication, and self-management. The second of the six Beyonds spoke volumes to me: “Beyond local to global perspectives, problems, and studies. It’s not just about one’s own nation and neighboring nations. In today’s world, the culture, economics, and politics of any nation might come to influence any other, and world-scale problems like global warming touch us all” (Perkins 2016). Study the key commitment for Include: “Demonstrate an understanding of and commitment to inclusiveness and respect for diversity in the learning community” (AASL 2018). I implore you to contemplate how critical it is for our learners to be inclusive. If learners are going to move beyond local, they must demonstrate the competencies within the Include Shared Foundation. In order for our learners to participate in solving the problems of our ever-changing and global world, they need to be equipped with the skills and abilities to create and build innovative solutions and then communicate them to varied audiences. The Shared Foundation Engage provides the competencies that learners require to do this: “Demonstrate safe, legal, and ethical creating and sharing of knowledge products independently while engaging in a community of practice and an interconnected world” (AASL 2018). While all six of Perkins’s Beyonds resonated with me, the Beyond centered on personal choice hit the mark: “Beyond academic engagement to personal choice, significance, commitment, and passion. In many settings, students have opportunities to pursue themes that resonate deeply for them” (Perkins 2016). This Beyond encompasses three of the Shared Foundations: Inquire, Curate, and Explore. Let’s start with Explore: “Discover and innovate in a growth mindset developed through experience and reflection” (AASL 2018). Explore invites our learners to pursue their passions through building on their own curiosity, reading widely, innovating, persisting, reflecting on and creating knowledge. Re-read the key commitment for Curate: “Make meaning for oneself and others by collecting, organizing, and sharing resources of personal relevance” (AASL 2018). Curation is a critical proficiency for our learners to possess. Knowing how to curate affords learners the tools necessary to mature as well-informed, culturally competent, and passionate adults. Finally think about Inquire; this Shared Foundation inspires learners to question and “engage in sustained inquiry” (AASL 2018). These aptitudes arm learners with tools that support their pursuit of personal choice. I hope that you will read Perkins’s article in its entirety. It will be interesting to discuss with your principal or superintendent. As a learner-ready school librarian, I believe it is imperative to be in touch with what administrators are reading and learning. It allows you to be conversant in issues and trends that impact the larger educational landscape. 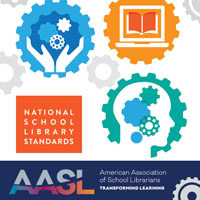 I think you will find as I have that you can easily connect the National School Library Standards to all education initiatives, trends, and issues that impact your school community. Finding common ground elevates our collective capacities to transform teaching and learning for ALL learners! You’ve got this learner-ready school librarians! Perkins, David N. 2016. “Lifeworthy Learning.” Educational Leadership73 (6): 12-17.